The blue Quadrille China Seas fabric pops off the Phillip Jeffries wallcovering. The Georgia coast, with its shimmering marshes and wide beaches, is a magnet for vacationing Atlantans year round, and, for luxury lovers, Sea Island is its crown jewel. 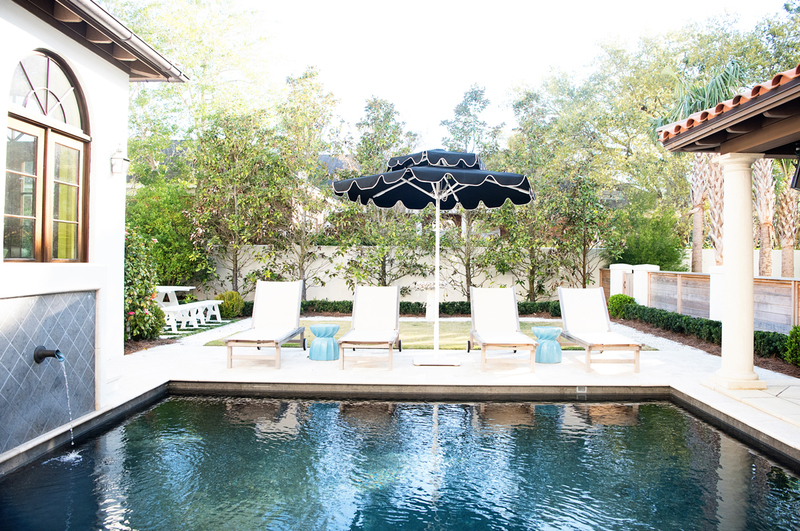 In this ritzy enclave and in nearby coastal communities, a go-to design duo is Adrian Johnson and Bethany Vann of Johnson Vann Interiors, based on neighboring St. Simons Island. 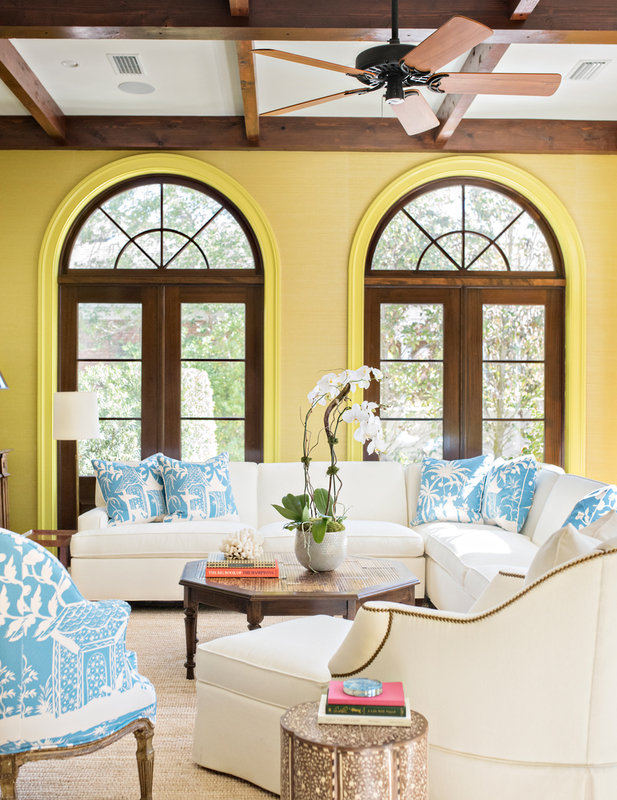 In a recent Sea Island project, the designers (whose portfolio includes the Sea Island Club itself) crafted a relaxing, cheerful getaway for three generations in this six-bedroom, six-bathroom, Mediterranean-style townhome near the Cloister. The Fifth Street townhouse is a short walk to the Cloister. Architect Joshua Youngner designed the townhomes so that each features a private courtyard and pool. 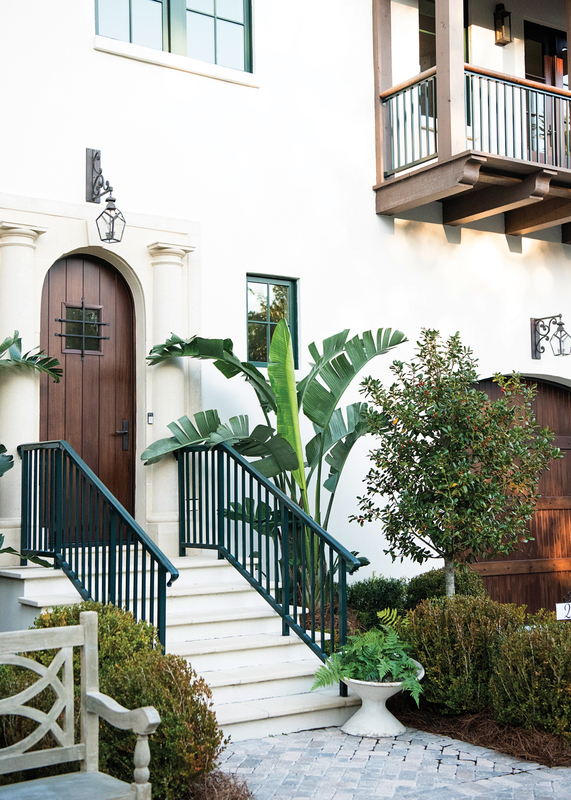 As a starting point, Johnson and Vann created a statement entryway with a faux bois wallpaper, a garden trellis, Chippendale railing along the staircase, and a settee that had been passed down in the homeowner’s family. 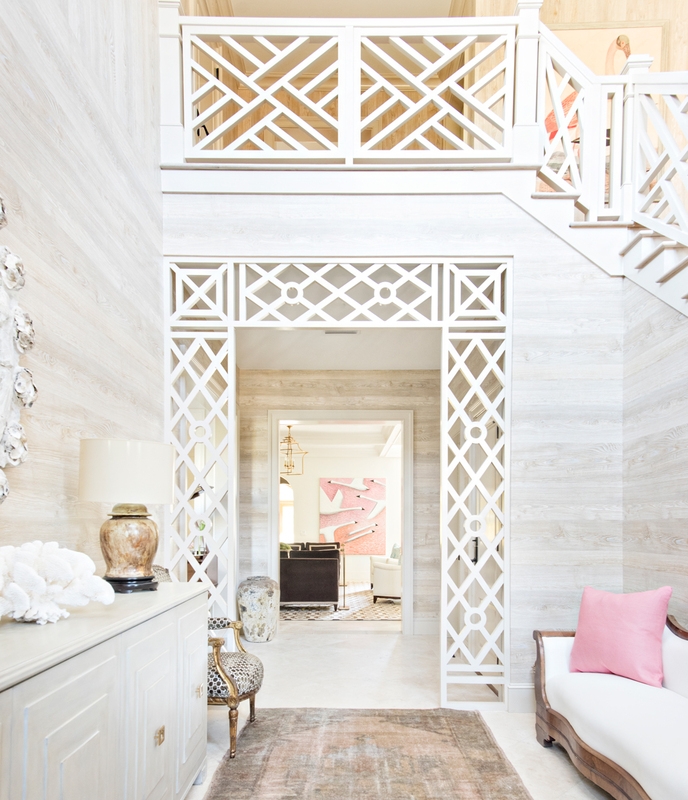 A neutral color palette with soft pinks emphasizes the calm, low-key ambiance the moment the door is opened. “We wanted them to come in to an entry area that was really special and immediately take that deep exhale,” says Vann. 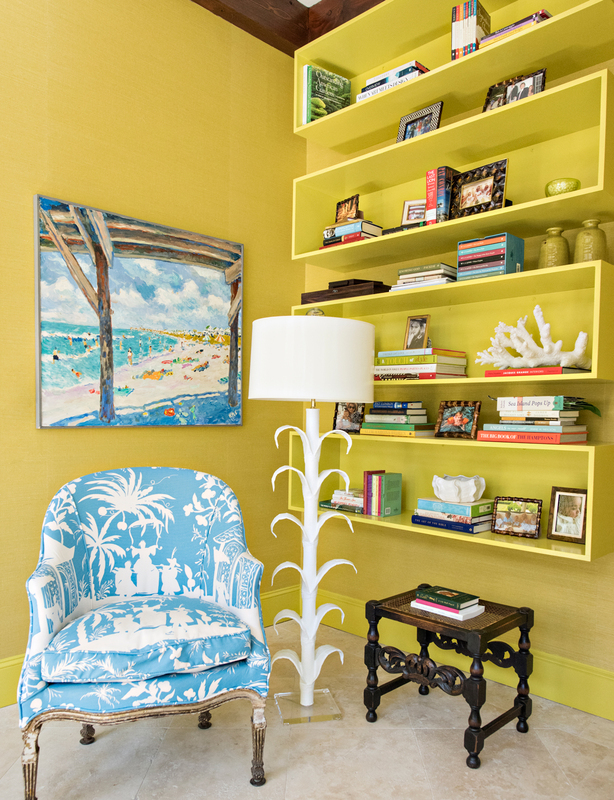 Vibrant pops of color add an upbeat vacation vibe in the bedrooms, which include custom bunkbeds for the grandchildren. The focus on family is reflected throughout the home, from a faux leather banquette designed to seat all the kids at the dining table to a custom Stark rug with a brown, circular geometric pattern in the living room, along with chocolate sofas. The grandkids’ room with custom bunkbeds features all the colors found in the house. Reversible Kate Spade throws have numbers embroidered on them to signify the kids’ birth order (and corresponding bunk). Upstairs, find a turquoise-themed bedroom with custom linens from JJA Interiors and drapery fabric from Quadrille. The matching bathroom features high-gloss turquoise walls. The private, gated community of Sea Island is one of the Southeast’s toniest zip codes, with around 600 homes—or “cottages,” which range from quaint to massive—and another 200 townhouses and condos. Homesites on Sea Island can be purchased for under $1 million, but property offerings regularly top $10 million. Real estate owners are eligible for membership in Sea Island Club, including the exclusive Spanish Revival–style Cloister and its world-class restaurants and spa, the Beach Club, with its three pools and five miles of private beach, and three championship golf courses. For a Sea Island vacation without a seven-figure mortgage, book a room at the grand Cloister, the rustic-luxe Lodge, or the more casual, less pricey Inn. The Lodge expanded last fall to include six new guest cottages, an 18-hole putting course, and an oceanfront pool. (Guess who designed the cottages? Johnson Vann.) Home rentals on the island range from condos to oceanfront mansions. From Atlanta, it’s about a five-hour drive to Sea Island or an hour-long flight to nearby Brunswick (or, ahem, to the private airport on St. Simons Island). The entry is framed by Chippendale-style fretwork. Sunroom Fabric on sectional: Thibaut, thibautdesign.com. Fabric on pillows: Quadrille, “China Seas,” quadrillefabrics.com. Stool: Bojay, bojayinc.com. Wallpaper: Phillip Jeffries, ADAC, phillipjeffries.com. Foyer Faux bois wallpaper: Nobilis, Jerry Pair, jerrypair.com. Buffet: Tritter Feefer, tritterfeefer.com. Pool Umbrella: Santa Barbara Umbrella Co., santabarbaradesigns.com. Chaise lounges: Kingsley Bate, kingsleybate.com. Bunk room Wallpaper: Phillip Jeffries. Lighting: Visual Comfort, visualcomfort.com. Throws: Kate Spade, katespade.com. Fabric for custom pillows: Thibaut. Floor pillows: Kate Spade. Bedding: Pine Cone Hill, annieselke.com. Guest bedroom Linens: Jenny Johnson Allen Custom Linens, jennyjohnsonallen.com. Custom raffia headboard: Donghia, ADAC, donghia.com. Nightstands: Bungalow 5, bungalow5.com. Benches: Hickory Chair with Lee Jofa fabric, ADAC, kravet.com. Drapery fabric: Quadrille.